Should You Use Article Directories To Build Links in 2017? Building links from various different sources to get a higher search engine ranking has always been one of the most popular SEO techniques. People have forever been using archives, blog listing, article directories, and so on to build links. But that was then. And this is now. Google has ruffled up more than a few feathers in the past couple years, and SEO as we knew it is no longer the same. So what about resources like article directories? Are they still relevant today in 2017? Article directories are places where you wrote an article ranging from 300 to 1,000 words (possibly more), and if approved, got compensated for the article in the form of a backlink, or money etc. The articles would mostly be published under your name, so you still retained some of the rights. Authors had bios at the end of their articles with possibly two or three links with keyword-rich anchor text. 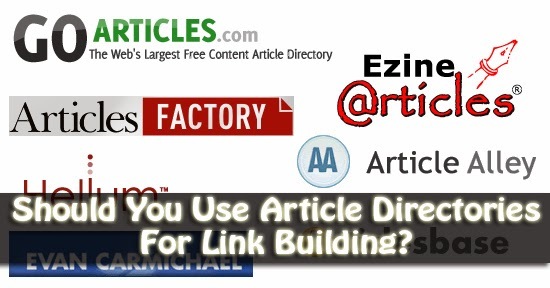 Article directories such as Ezine Articles, Articles Factory, Go Articles etc. were very popular, and had twofold benefits. For one thing, they were a way of building relevant backlink that can't be questioned. And for another, they provided a way of earning a quick buck by writing articles. Hundreds and thousands of people quickly realized the potential, and started contributing massively to compete for the leader-boards. These popular article directories, however, had pitfalls. You submitted an article to a bunch of different directories, and got lucky if more than one of them accepted it. Anyone could download, or pay to download such articles. This used to benefit the authors since whoever downloaded those articles and put it on their own sites gave links to the author. In practice, this often tends to be lower quality stuff. Often times, spammy and low quality content gets sprayed off article directories, and syndicated all over the web. So Google has now begun to penalized links generated in such a manner. Besides, not every website that your content gets downloaded to is a good quality website. Hence, links generated in this way are seen as spammy, or bad links that could cause a penalty.